Click here to visit their site and click “Get Your Free Bottle.” On the next page just fill out the form. If you don’t get it today, no worries because they’ll be doing this everyday until April 26th. Bayer, be sure it is there when you need it. i want this sample please. 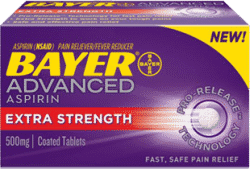 Bayer sure would help my aching back!!!! I would love to try it out! I have fibromyalgia and would like to find a permanent RX for the pain. Really need this can’t afford aspirin.